The Domino Clownfish is a designer clownfish that is a Black Ocellaris Clownfish (also called Darwin Ocellaris Clownfish) without stripes, but with some white markings which can include white dots on its cheeks, a partial head bar or other minor white markings. Each Domino Clownfish is highly unique making them a very sought after fish. The Domino Clownfish is similar to the Nearly Naked Clownfish, but is a black variation. Domino Clownfish are brownish when they are very early juvenile and then develop their deep black coloration as they grow and mature. 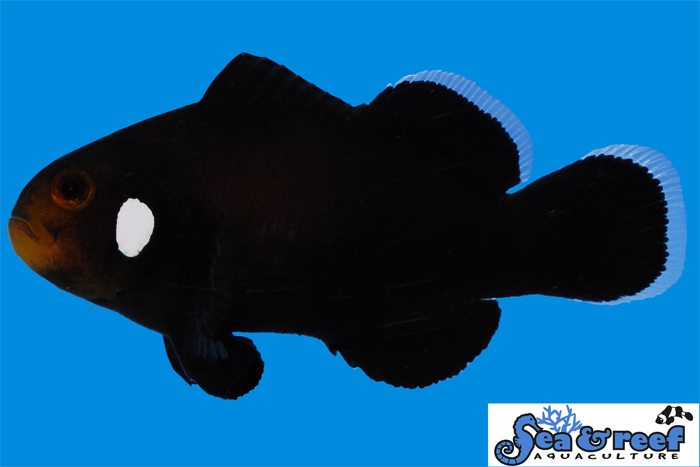 Some of our fish are jet black around 1 ¾”. The brown markings around their face are the last part to turn black. They are just gorgeous and an excellent reef fish. The temperament and captive care requirements for Domino Clownfish is very similar to that of the regular Ocellaris Clownfish. It is peaceful and hardy. They thrive in saltwater aquariums with or without an anemone present. Like the regular Ocellaris Clownfish the Domino Clownfish will readily accept a wide variety of host anemones and many hobbyists keep it with the popular and hardy Bubble Tip Anemone (Entacmaea quadricolor). As a reference the natural host anemones of the regular ocellaris clownfish are Magnificent Sea Anemone (Heteractis magnifica), Giant Carpet Sea Anemone (Stichodactyla gigantean) and Merten's Carpet Sea Anemone (Stichodactyla mertensii).